Citation Information: J Clin Invest. 2007;117(4):1068-1077. https://doi.org/10.1172/JCI30117. Generation of mice deficient for Vhlh, Vhlh/Hif-1α, Vhlh/Hif-2α, and Vhlh/ Hif-1α/Hif-2α in the liver. (A) Genomic maps of the Vhlh (2-lox), Hif-1α (2-lox), and Hif-2α (2-lox) conditional alleles. Numbered boxes represent exons targeted for deletion. The locations of LoxP sites and primers used to amplify the conditional allele (2-lox), recombined allele (1-lox), and WT allele are shown with gray triangles and arrows, respectively. N, NcoI; E, EcoR1; P, PstI. (B) Genomic PCR analysis of DNA isolated from the tail (T) and liver (L) of PEPCK-Cre mutant mice. (C) Genomic PCR analysis of DNA isolated from the tail and liver of 4-week-old albumin-Cre mutant mice. Note that mice were bred in a mixed genetic background. Occasionally 2 different Hif-2α WT alleles were detected by genomic PCR analysis, suggesting a polymorphism in the amplified region. (D) Western blot analysis of nuclear protein isolated from livers of the following albumin-Cre mutant littermates: lane 1, -Vhlh haploinsufficient for Hif-1α; lane 2, -Vhlh/Hif-1α haploinsufficient for Hif-2α; lane 3, -Vhlh/Hif-2α; lane 4, -Vhlh/Hif-1α/Hif-2α; lane 5, -Vhlh/Arnt; and lane 6, Cre-negative mice. 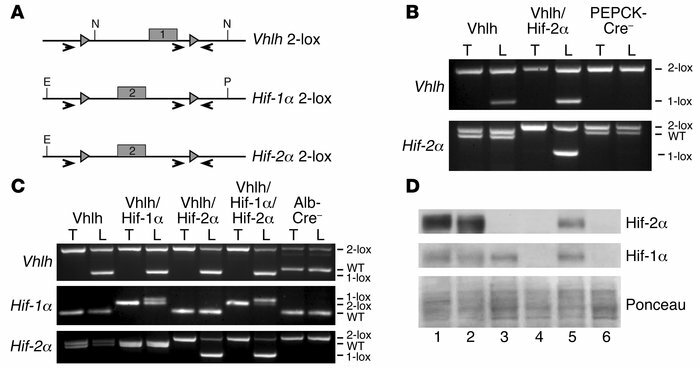 Note that the recombination efficiency of the Hif-1α conditional allele is best determined by comparing Cre-negative control mice to Vhlh/Hif-1α/Hif-2α mutant mice due to the presence of nonrecombined inflammatory cells in albumin-Vhlh/Hif-1α mutant mice.